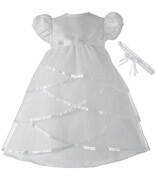 Planning your baby's Christening is stressful enough without having to worry about finding the perfect gown. There are a few options here, so don't worry! One option is to purchase a one-time use polyester or other synthetic fabric gown for $50-100, and donate it after the big day. The better option is to purchase a 100% silk gown and bonnet, hand-made, and keep it in your family to pass along through generations of children. Of course this second option is more expensive, as hand-made silk Christening gowns will set you back several hundreds of dollars. But if you value tradition, this is the option for you. Because everyone has different budget requirements, below we list beautiful options that have been well reviewed but cover a range of prices. 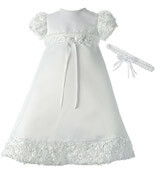 We list Christening gowns under $100, under $200, under $300, and under $500. Of course, you can also get a beautiful custom-tailored and hand-made 100% silk gown made for you by a boutique, but that will likely set you back about $1000-2000.